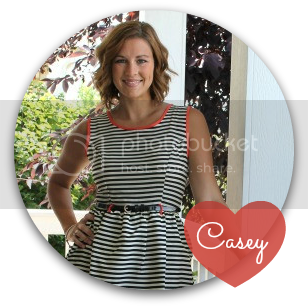 Love, Life, and the Pursuit of Happiness: Cheesy Chicken and Rice Casserole and a Giveaway! 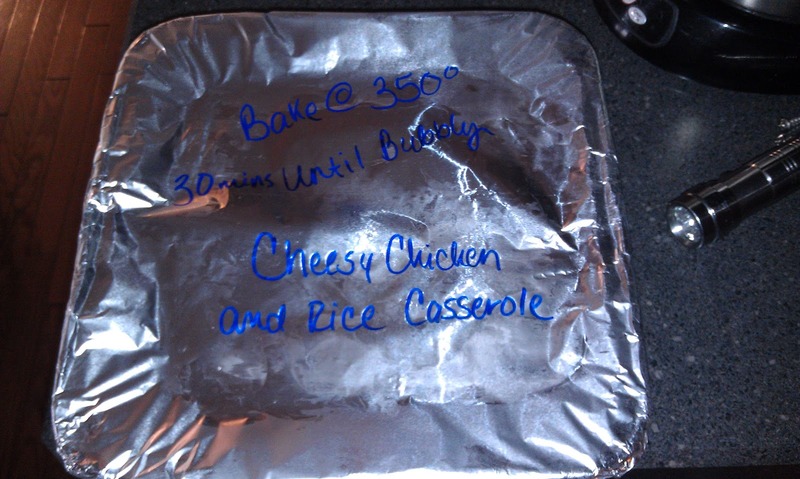 Cheesy Chicken and Rice Casserole and a Giveaway! Last week I had some time to make my shopping list and head to Kroger for their awesome Buy 5 - Save $5 event. I left with 3 - $5 coupons to use for buying participating General Mills items. This amazing sale is running through today so grab your buggies and load up! Kroger, General Mills, and My Blog Spark have also partnered up to give me a $25 Kroger card for one lucky reader! So if that's not incentive enough to get shopping I don't know what is! My first recipe for 30 Days of Baby is a fabulous Cheesy Chicken and Rice Casserole. I found this recipe via Iowa Girl Eats and it is a winner. It froze well, reheated well and tasted fabulous! Unfortunately, I somehow missed several pictures along the way. Sorry about that. 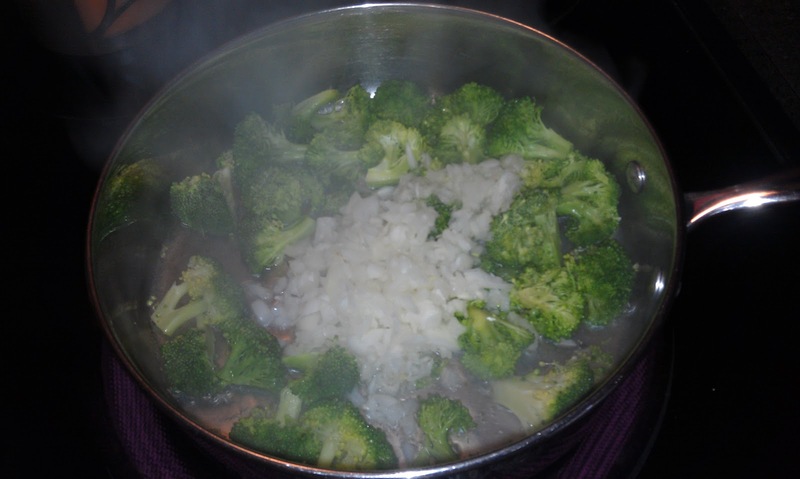 The first thing I did was lightly steam my brocolli and boil my chicken. I make and save all my chicken broth so we are not getting all the added sodium from the store bought stuff. 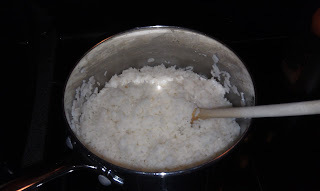 Then I cooked my rice in the chicken broth instead of water. 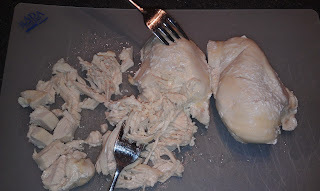 My favorite way to prepare chicken for casseroles is shredding it. I simply take two forks and, well, shred it. :-) This keeps me from having to cut up food at the dinner table. I know that sounds petty but people, getting dinner ready for 3, almost 4 kids is no joke. They are done before I even get to sit down! Then I combined all the ingredients and put them in a disposable pan. I layer all of my frozen meals with plastic wrap and tin foil to prevent freezer burn. Then I labeled the top with cooking directions so I don't have to look it up later. Cook rice according to package directions, substituting water for chicken broth. When rice has 5-7 minutes left until fully cooked, add broccoli and green onions into the pot to steam. Meanwhile, heat a large skillet sprayed with non-stick spray over medium-high heat and cook seasoned chicken until done. Remove chicken to a plate and carefully wipe out the inside of the skillet with a paper towel. Turn heat down to medium. Add milk into the skillet, then sprinkle in flour and whisk to combine. Gradually add remaining 1 1/2 cups milk while whisking constantly, until mixture is thick and bubbly, about 10 minutes. Turn off heat, then add 8oz shredded cheese and sour cream. Mix until combined. Season with garlic powder, salt and pepper. Combine cooked rice/broccoli/green onion mixture, chicken and cheese sauce, then stir to combine. Pour mixture into a non-stick sprayed 9×13 casserole dish and top with remaining 4oz of cheese. Broil until cheese is golden brown. Let casserole cool for 5 minutes before serving. Double layer with plastic wrap and tin foil to prevent freezer burn. Add a little water to the meal before reheating to keep it moist. I usually add about half a cup. Label before you freeze with cooking directions so there is no looking up later. Now for the Giveaway! There are 6 fabulous ways to enter. Thank you, I replied to your email. Have a good one!